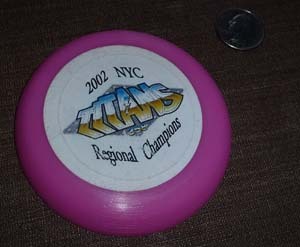 2002 marked our first Regional Championship! 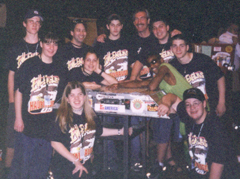 This is also the first year we began attending a second Regional event. We were "Team Titans!" and our motto changed slightly to "Another one fights the rust." Our design this year struck out in a new direction with the development of a cross-axis crab drive. It proved somewhat difficult for the drivers to become accustomed to, but gave us some distinct advantages. The only drawback was the motors were split between the two drive trains thereby reducing our overall pushing power. Our robot carried a memorial plaque in memory of Richard Day, an employee of our Festo sponsor who had been responsible for receiving the robot crates and storing them before the Long Island event in the Festo warehouse. We shared competitions with rookie Smithtown and at the Long Island Regional we were voted the Incredible Play Award by the other teams competing, for completely turning around a match that was all but lost after we were pinned for half the match (and for inadvertently crushing a MouseBot, sorry about that!) and the GM Industrial Design Award. We went into the finals ranked 11th, but moved up into an alliance captain position choosing Team 56 from Bound Brook, NJ and Team 870 of Southold, NY as our partners. We fell in the semi-finals (Hey, still one of the top 4 alliances!). Teddy Melnick was our driver and Mr. Chant coached. In the New York City Regional we went into the finals in the 4th alliance and took 1st place with the SIE H20 BOTS (T.R.I.B.E.) Team 237 and Team 549 , the Devil Dawgs from Leominster High School in Leominster, MA. From there we went to Nationals (Championships)(travel plans) and were in Curie again seeding in 21st place with a record of 4:3:0. The last year it was held at Epcot. Half the team split off before the Championships to compete for the first time in BattleBots IQ. THAT was quite an eye opening experience. Our robot reused some of the FIRST electronics, motors and pneumatic actuators from our FIRST robot. 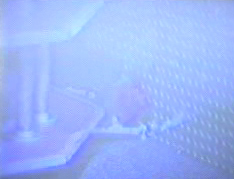 After one competition ended parts were immediately removed from the robot and reused in the other. Our BattleBots robot was under powered and under armored compared to the veteran teams. We were rebuilding everything after each match. In spite of the challenging circumstances we took 4th place by sheer luck. We flipped a really good robot and by chance when it landed it ended up balanced on it's side rendering it unable to move. We took home prize money that helped us purchase a good used TIG welder that Mr. Wisniski found for us and it's been a mainstay of our FIRST capabilities. The overload of two near simultaneous major competitions was quite a drain on our teachers, mentors, and students, so that was the only year we did BattleBotsIQ. 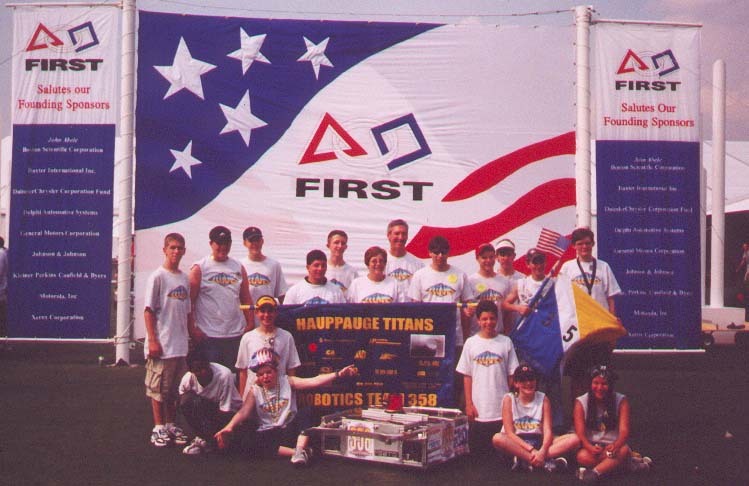 This was also our first year directly mentoring a rookie team (Smithtown). Smithtown is close by, in fact in the 60�s we were the same school district before Hauppauge broke away. The town�s and school districts overlap quite a bit. We assisted with an engineer, shared our practice field, provided parts and raw stock. We were without a mechanical engineer this year as the only one we had last year (from Festo) had to spend all his available time getting Smithtown going. We did have a Festo marketing manager though who proved more than up to the task when we performed better than in our two previous years with an ME by winning our first regional competition. We did something really interesting when our robot was designed with a crab drive for the first time and a gravity drop down arm combined with a pneumatic pusher. 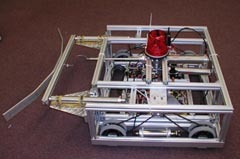 The crab drive was simply two drivetrains, one inside the other. The inside drive was raised or lowered via a pneumatic piston and acted as a brake as well as a method of instantly changing direction 90 degrees. The pusher didn�t have as much oomph as we were hoping for, but it gathered the goals well. It was definitely a year for dual-drivetrains though. While we developed our cross-axis crab drive, our rookie friend Smithtown built a wheeled drive for moving fast that would rotate out of the way to bring into play an alternate track drive for pushing wicked hard and strong. The team didn't yet have a Booster Club to help with fundraising, T-shirts, and team give-aways. 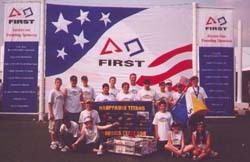 The team advisors were responsible for organizing it all, and the students made it a reality. Our give-aways this year were Titan (the planet) buttons. Our team members actually had to split into two teams, because we also tried BattleBotsIQ (IQ's second year) and the competition dates somewhat conflicted and students couldn't miss so much school to go to both events. We used first parts scrounged from robots and had to replace some on our FIRST robot before we could play at Epcot. We competed in the Curie Division, but weren't chosen for Finals - Curie Standings. It was the last year Championships were held at Epcot. After the season we gave a presentation to the 5th grade at the Pines Elementary with hands-on activities and robot demonstrations.